Corporate social responsibility (CSR) is a guiding principle of many organisations. It also forms part of the policy framework of some corporate regulators. The relatively monolithic nature of corporations and regulators contrasts with the diversity often found within communities affected by a business or public sector activity. Those seeking to satisfy their CSR obligations and aspirations need a means of understanding the complex positions of the communities they affect both at key decision points and as they evolve over time. Meetings and conversations offer an opportunity to develop an understanding of the intentions and preferences of communities. However, the time and expense involved in face-to-face interactions, even community meetings, usually limits their scale, how frequently they can be refreshed and the length of time over which it can be sustained. Paper and online surveys are one way to overcome the limitations of scale but these introduce other constraints. Standard surveys are designed to explore a set of defined topics. They draw a boundary around the conversation. They can embody indications of which factors are expected to be important and what is assumed to be a desirable outcome. This might be due to topics being excluded because they are not thought to be important. Topics that are included might be framed in a way that conveys a sense of a preferred outcome and placing certain words at the high or low end of a rating scale can give a subtle indication of priorities. It is likely that a conventional survey will overlook something a respondent would have raised if the process had left the way open. Very often, it will also offer an opportunity to ‘game’ the process by submitting responses that convey a sense of delight or dissatisfaction to those issuing the survey, regardless of the facts of the matter. Surveys can be used to register a protest or make a point that is not necessarily related to the subject of the exercise. There is a method that allows researchers to give many people the opportunity to convey what really matters to them and why it matters. It is based on the field of work known as sense making, finding meaning in a complex situation such as the interaction between a community and a major public or private sector activity that affects them. The application of sense making outlined here uses the experiences or observations of members of a community as its source material. Respondents offer a short recount of a past or anticipated experience and indicate what they think is significant about it through a mechanism that avoids most of the potential for gaming mentioned earlier. It is relatively inexpensive and readily scalable. The principles on which it is based are the work of David Snowden of Cognitive Edge. They can be applied at workshop scale or expanded to hundreds or thousands of people, each making single or multiple contributions using web-enabled tools via computers, tablets or smartphones. The tools that allow these methods to be used at large scale form part of the SenseMaker™ suite. A core principle of this work is that telling personal stories, even very short experiences, is a natural means of communicating our interests and aspirations. It is so common that it is generally overlooked. An opening such as “What have you noticed about …?” will elicit a reaction driven by what matters to the respondent. The process taps into the sort of information a human investigator might discover if they had the time to engage a large number of people in private conversations. The second principle is to seek patterns in the responses before looking for conventional measurements or meaning. If asked to rate their experience using conventional scoring mechanisms, contributors might not only be drawn into gaming behaviour but often have difficulty relating the scoring scheme to their experience. The scoring scheme might be based on a view of the world that is different from their own. When this happens, many will opt out or offer a lazy response such as rating everything high, everything low or everything half way between. This conveys no useful information and certainly will not help discriminate between separate aspects of their experience, which might include some good and some bad, some pleasant and some unpleasant, some noteworthy and some of no interest. Seeking patterns in the data and using them to gain insights or stimulate further enquiries is the heart of the analytical process in this method. Several people might refer to essentially the same topic or concern using different words, some explicitly and some implicitly, some directly and some obliquely. If these related contributions can be identified, because the respondents classify their contributions in the same way, they can be extracted. An examination of this smaller set of narratives may yield valuable insights in addition to those gleaned directly from the patterns in the data and the quantitative information it contains. Dealing with these smaller sets of contributions is more manageable than trying to make sense of the entire set, partly because the number of items is smaller and partly because the subset is cohesive, the contributions have something in common with one another. As the approach is relatively new and the descriptions to this point may seem rather abstract, a small illustration of the way contributions could be collected is provided here. While it is simpler than most collector designs, it could be a viable data collector for a SenseMaker™ exercise. Readers can go through the process of completing this if they wish to gain a sense of how respondents might find the process. In a real exercise, all contributions are anonymous. They would then be asked to place a mark inside each of the following triangles to indicate the balance, in their contribution, between the factors shown at the corners or to mark the ‘Not applicable’ option. There might be half a dozen such questions. To explain how to use the triangles, which are known as signifiers, an example would be provided using something very familiar, possibly as shown here. To help make sense of the inputs, simple information about location, gender, age or other factors might also be gathered. One individual might observe several matters of interest to them and they can contribute each one as separate inputs if they wish. They are also able to return to the process over time and make fresh inputs whenever something of interest arises or to record regular observations as a form of journal. The individual responses are gathered and assembled into summaries that might appear as follows. The results might be coded to show, for instance, responses from people who are employed on the operation or have a family member who is employed there (grey dots) and those who have no employment connection with it (blue dots). This information can be examined in many ways. It can be filtered by characteristics such as gender, location, the date of the contribution, whether the contribution was regarded as positive or negative and anything else that has been recorded. By observing patterns, exploring differences and examining the text of contributions that fall into clusters, useful insights can be gained. These insights flow from the people who provided the inputs and are described in terms meaningful to those people. They are not guided or conditioned by those conducting the analysis. So long as the framework is well designed, with factors that are relatively high level and stable, this method can support tracking changes over time even if new issues arise or the community undergoes significant changes. There may be shifts in the physical circumstances of the system being examined or in the concerns circulating in the community. Over time, if something unexpected crops up, people can introduce it to the analysis and it will be made visible by changing patterns in the responses. The practice of allowing corporate personnel only one day a year to provide such support. A SenseMaker™ exercise gathered information from a diverse pool of charity organisations. It asked about occasions when individuals could have benefited from assistance. 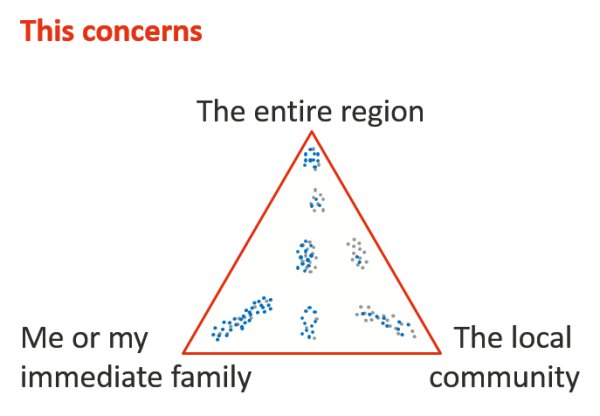 The responses were examined using the respondents’ inputs, in a similar way to the illustration outlined earlier, to identify clusters with related characteristics. Common technical, administrative and managerial needs were identified but, more importantly, a theme emerged that opened the way for a mode of engagement that had not been considered up to that point. It became clear that there are in fact many challenges the charities face that are can be resolved in a few hours with advice from someone with the required expertise. This opened a path for corporate personnel to offer their one day a year of funded effort to provide assistance to charities. It enabled people to get past that apparent constraint and see the potential for valuable support to be provided. The outcomes of this exercise are specific to the context of this particular study but the underlying lesson is generally applicable. With the best will in the world, existing views of what is possible may be locked into stale or stagnant positions. Valuable alternatives may be out of sight because of the effect of entrained patterns of thought. A tool that allows us tap into a diverse community may open doors that no one even realised were available to them. The process also offers scope to build a relationship between stakeholder groups on a fresh and more productive basis. This offers a way to redress the balance between large monolithic stakeholders and the diverse members of the communities with which they interact. The approach has been used in NSW to explore the operation of the Meals on Wheels service. Here too, fresh insights were unlocked by allowing staff, volunteers and clients to explore their requirements outside the established framework of ideas surrounding this long standing and highly regarded service. Once again, the insights seem straightforward after they have been exposed but were obscured by entrained patterns of thought. The method has been used on a very large scale in geographically dispersed communities to support overseas aid programs in Africa, the Middle East and South East Asia. Some of these exercises drew in thousands of individual responses without any modification to the method or tools. The power of sense making, in the form described here, stems not from any software used to support it but from the adoption of a fresh standpoint. Instead of using analysis based on ideas drawn from the past to create a framework for engagement or exploration, which places boundaries on what will be discussed, it sets out to enable inputs to be gathered without any influence or bias being introduced by the analysts. The SenseMaker™ software is a tool that enables the implementation of this approach at large scale with limited cost. It can be deployed via web browsers or on applications for mobile phones and tablets. Paper input can be used as well where this is more appropriate for the people involved or where technology is not available. It offers a means by which a community’s voice can be heard without filters being placed between them and the decision makers who need to understand what the community is saying. It can operate at scale, with geographically dispersed populations and be sustained over time to track changes and accommodate shifting concerns within a community as well as changes in their environment.